Drying onions and garlic is easier than you think. It’s a simple process with delicious results. These dried jewels have many uses in the kitchen. They are versatile and will become a staple in your kitchen. 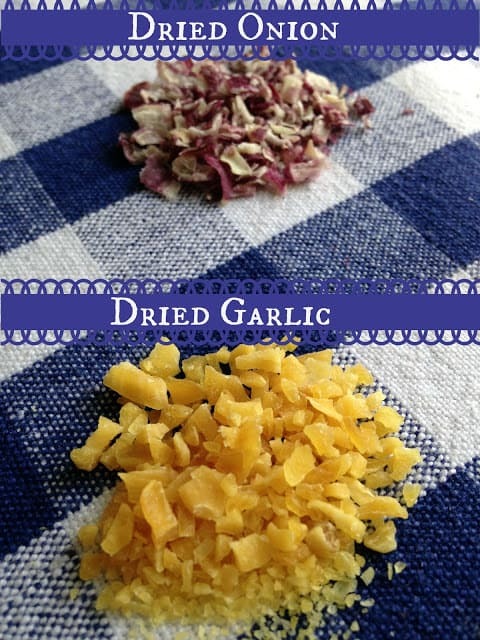 Dried onions and garlic can be used just like fresh onions and garlic. Easily reconstituted by adding to soups, stews and chili. Dried onions and garlic can be used in dips and sauces. With dried onions and garlic, you can make your own onion-soup mix and both can be added to many seasoning blends. The onions and garlic featured in the photos have only been dried for four hours. The longer you dry them in the oven, the smaller and more brittle they become. My favorite way to use dried onions and garlic is to make homemade onion soup mix. Making your own onion soup is easy and affordable. Keep in mind when using homemade onion soup mix, homemade is going to be much more flavorful. Another point, it’s going to “look” different than the packaged variety. This will depend on the type of onions used and spices. A fast and easy way to dry onions and garlic. Preheat oven to 150 degrees. Scatter on baking sheet in a single layer. Place trays in oven. Drying time should take between 6 to 10 hours. Check often during drying time. The onions/garlic will be brittle when dry and will crumble when crushed. Store dried onions/garlic in a cool, dry place at room temperature in an airtight container. 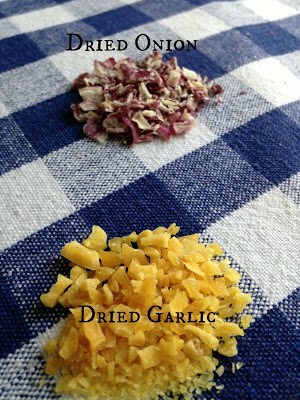 *Recipe Note: The garlic and onion in the photo above are shown after 4 hours of drying time.